Enter to win a kindle copy of this book! When fifteen-year-old Julia Beaufort-Stuart wakes up in the hospital, she knows the lazy summer break she'd imagined won't be exactly what she anticipated. And once she returns to her grandfather's estate, a bit banged up but alive, she begins to realize that her injury might not have been an accident. One of her family's employees is missing, and he disappeared on the very same day she landed in the hospital. Desperate to figure out what happened, she befriends Euan McEwen, the Scottish Traveller boy who found her when she was injured, and his standoffish sister, Ellen. As Julie grows closer to this family, she experiences firsthand some of the prejudices they've grown used to-a stark contrast to her own upbringing-and finds herself exploring thrilling new experiences that have nothing to do with a missing-person investigation. Before she was Code Name Verity, she was just Julie, a young carefree girl just turning 16 and home for the summer to enjoy her grandfathers estate one last time before it turns into a school. She gets there a few days ahead of schedule and before letting anyone know she has arrived she decides to go on an adventure. She is attacked from behind and winds up in the hospital with no knowledge of what happened. She befriends her saviors, two young tinkers whose family has been camping on her grandfathers land for a long time. 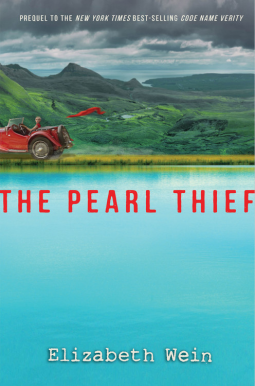 This book explores the prejudices surrounding gypsy's, the mystery of Julies attack, missing pearls and an ancient boat wreck that might hold more secrets than anyone knew and the coming of age of a truly adventurous woman. Julies new friends are constantly under suspicion from people around her other than her family. If something goes missing or wrong they are the first ones people blame. So when a body is found the police look to Julies new friends. Wonderfully written, keeps you guessing with all the moving parts and different layers. I loved Julie from Code Name Verity and it is wonderful to connect with her again and see how she became a British Spy during WWII. I can't say enough about this book I was so thrilled to receive an advance copy and was bummed that I only got to it recently. Fabulous book. Disclaimer: I received an advanced e-galley of this book from the publisher from netgalley.com in exchange for an honest review.